This option includes all equipment to reduce radial runout (RRO) or radial force variation (RFV) by grinding the tread face. This permits you to rework tires that fail force and runout grade limits, and reduce the number of tires that are scrapped or downgraded. Runout grind reduces radial runout and improves roundness. Runout grinding uses a flat-faced grind stone, 254 mm (10”) wide. The Center Grinder can also reduce radial force variation using an optional curved grind stone by removing tread rubber across the tread face in the area of high force. Included is one flat face 80 grit carbide grinding stone, and a fully programmable positioning system. Force Variation and Radial Runout waveforms can be displayed in real-time, during the grind operations, to show the original values, and most recent values. This option includes all equipment to reduce radial force variation (RFV) by grinding the shoulder area of the tire. This permits you to rework tires that fail force variation grade limits, and reduce the number of tires that are scrapped or downgraded. 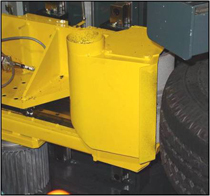 The shoulder grinders reduce force variation by reducing the footprint of the tire in the area of high force. The grinders are positioned according to feedback from the force measurement system.